The bad news is that we’re not going to get a new Batmobile with the Batman v Superman: Dawn of Justice sequel, Justice League. 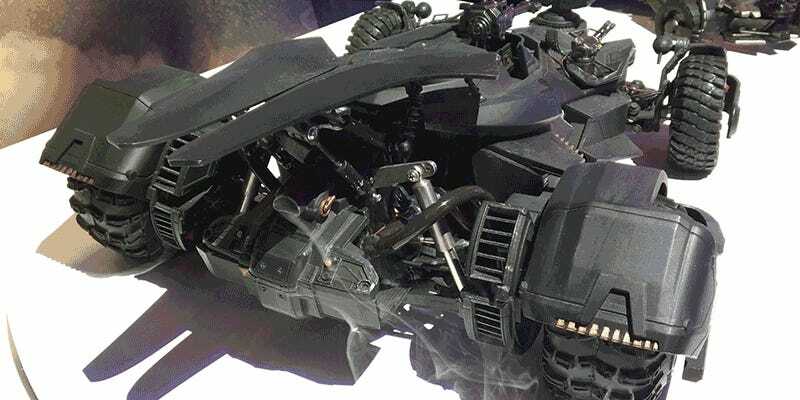 The good news is that Mattel has created a remote control version of Ben Affleck’s batride with so many features that could probably be used as a miniature replica in the film. When available sometime in the fall later this year, the Justice League Ultimate Batmobile will come with a very collector-targeted $250 price tag. But that’s not the only reason parents might want to think twice about buying this one for their kids. To make it function as close as possible to the full-size Batmobile that’ll be used in Justice League, Mattel has incorporated an oil-based vape into the RC car so that after you gun the engine, the toy produces realistic smoke coming out of its exhaust pipes. Before you start putting your lips to the Batmobile’s rear end, you should probably know that it uses a special included oil to produce its realistic exhaust, so adding your own vape flavor and taking a hit isn’t recommended. Under the hood you’ll find an included Batman figure brought to life by the Justice League Ultimate Batmobile’s steering wheel that turns along with the rest of the car, while on the hood is a pair of spinning, rotating gatling guns that point in the same direction as the vehicle’s traveling. 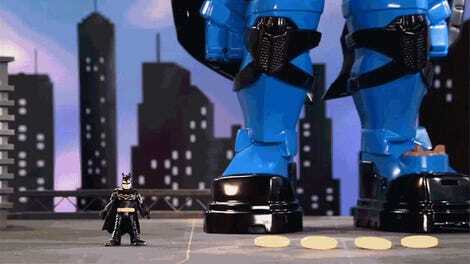 If it’s a trick the movie Batmobile can do, this RC version can probably do, too. We can’t help but feel a little disappointed that controlling the Justice League Ultimate Batmobile is done through a smartphone or tablet using a free accompanying app. Touchscreen controls have time and time again shown themselves to be less than ideal for controlling RC toys, and for $250 the lack of an included dedicated remote feels like a bit of a cheap out. 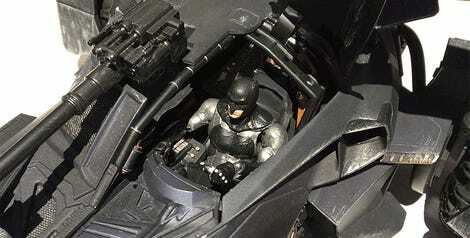 However, Mattel’s justification for relying on a touchscreen device to control the toy can be found over Batman’s shoulder inside the cockpit. There you’ll find a camera that streams live video of what Batman sees while driving the Batmobile, including a dashboard that comes to life through augmented reality, and simulated bullets and projectiles coming out of the cannons. Aside from Batman and stunt professionals, few people ever get to drive the Batmobile. But this seems about as close as anyone can get to borrowing the Dark Knight’s ride.